What does one say about the Grand Canyon? Is it even possible to capture in words or images? Sometimes, yes; often, no. Of course it is majestic, magnificent, jaw-dropping, awe-inspiring, breathtaking. But what else? 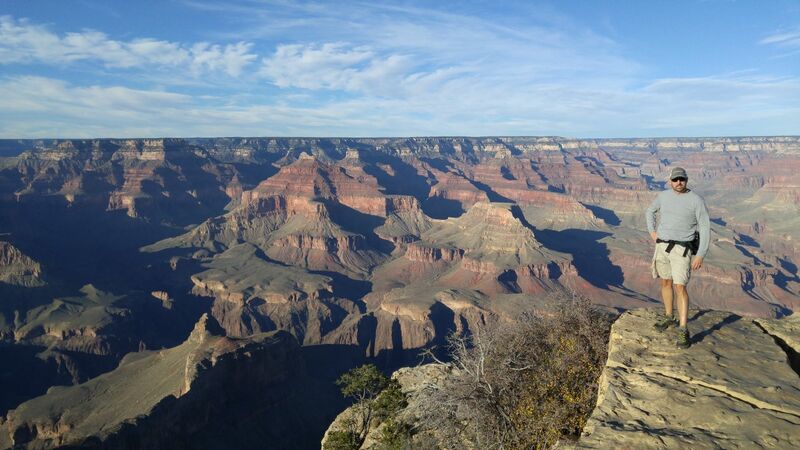 How can we articulate something so enormous, so ancient, so mesmerizing as Grand Canyon National Park? Indeed, as the park’s website confirms,”Grand Canyon overwhelms our senses through its immense size.” And it does. Teddy might be disappointed to find many, many buildings now occupying the South Rim of Grand Canyon National Park, but he probably would not be surprised by the want to share and the need to explore — not just the terrain, but the soul. 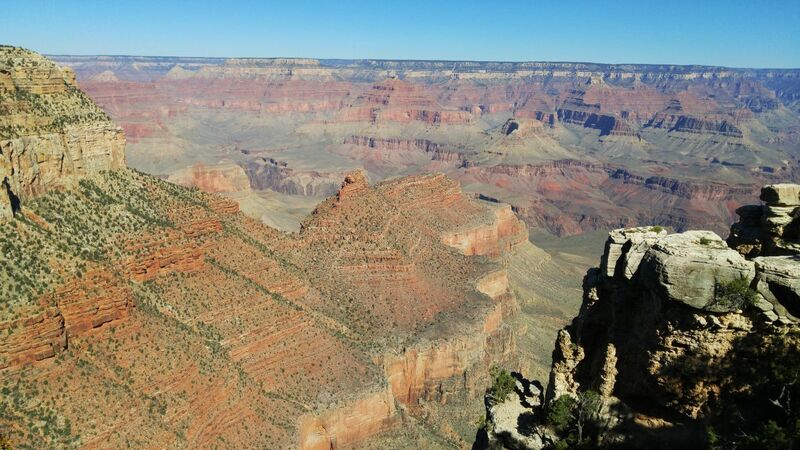 In the least, Grand Canyon National Park is spectacular. At the most, it is much, much more. The Hopi call it Ongtupqa. 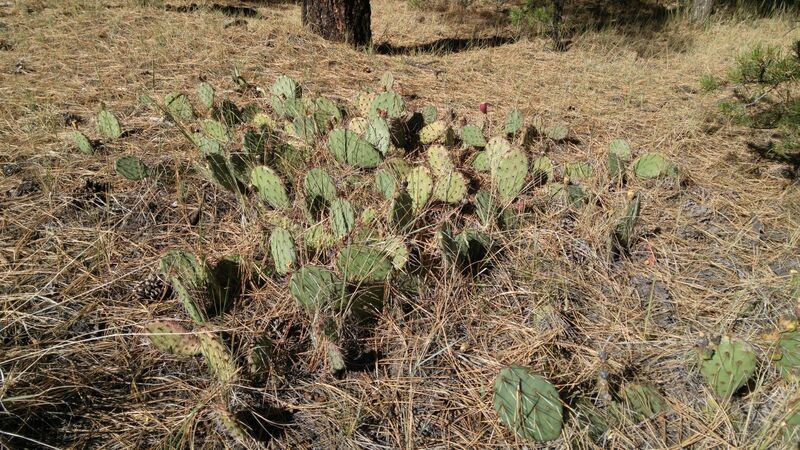 The Yavapai call it Wi:kaʼi:la. The Navajo call it Tsékooh Hatsoh. The Spanish Gran Cañón. One thing is for sure, everyone who visits — over five million per year — knows it as the Grand Canyon. At 277 miles long, 18 miles wide and over one mile deep, there is a lot to see. With five to six billion years of history — two million of that exposed — there is much to know. And with thousands of years of consistent Native American habitation in the area, there is a lot to understand and consider. 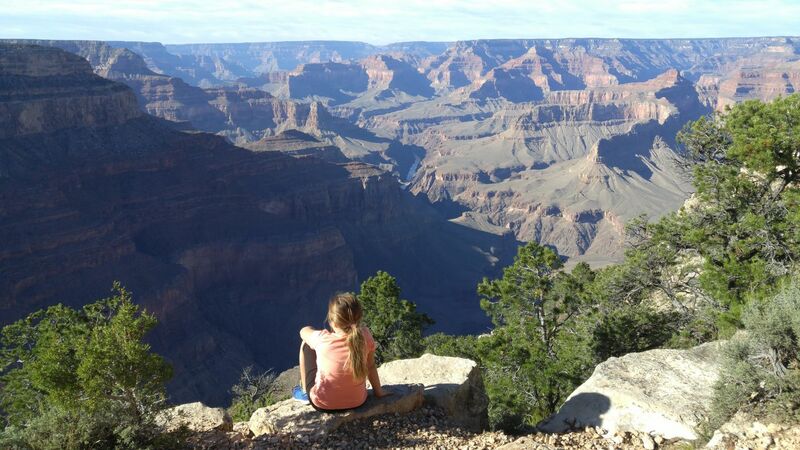 It could take years, perhaps lifetimes, to take in all that the Grand Canyon has to offer. It has a lot to tell. … to take a picture of this Supai Group of rocks. Bright Angel Trailhead overlook. 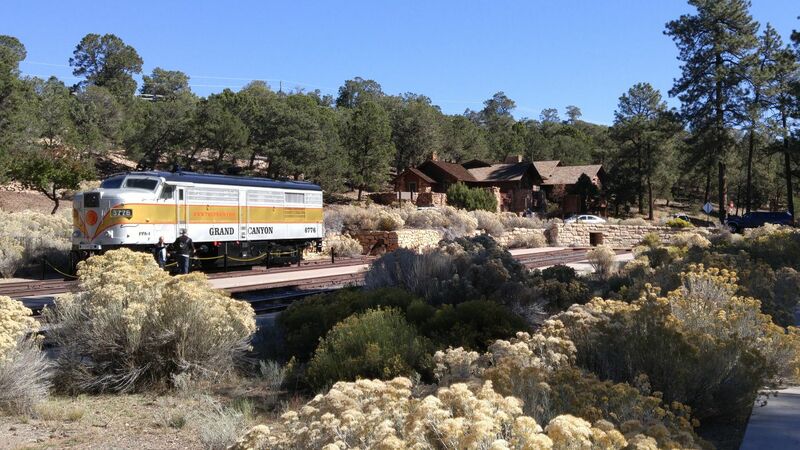 Mostly this begins at the South Rim at Canyon Village, where folks descend by car, train, bus, bicycle or on foot. In summertime, it is mayhem. I say this from experience and from employees of the park, who take care to see that we all have a good time … and a careful one. However, we made our way in October, a beautiful time to be there. 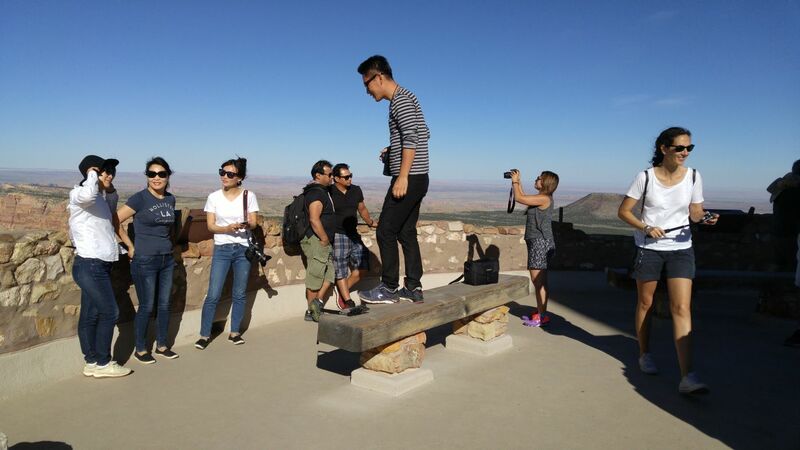 The weather is cooler, the hikers and visitors more experienced and seasoned, and the tourists fewer. 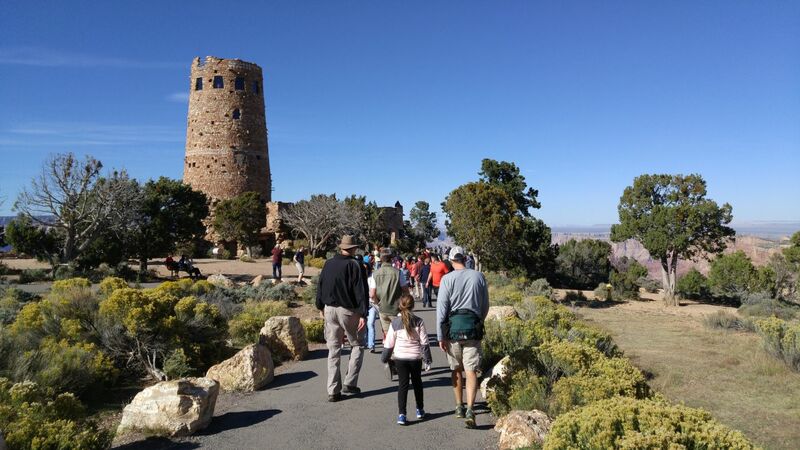 At this time, mature outdoor enthusiasts can navigate Bright Angel Trail anytime of day; cyclists and runners and walkers have the roads and trails to themselves; families can tuck in without feeling crammed (Mostly. Maybe not the buses. ); and the canyon is ours to enjoy more quietly and effortlessly. We did so from Maswik Lodge, an older motor lodge made up of several buildings and pleasant rooms. 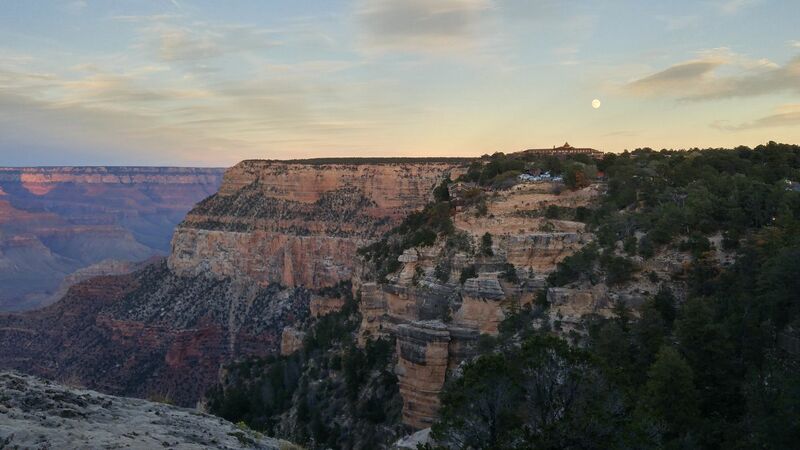 Truly just a few steps away from the rim of the canyon, we headed there often — before hikes, before and after meals, for morning and late night views (especially with the full moon! ), for jogs, for conversation, for quiet. Maswik Lodge is nestled in the forest, so it always makes for a delightful, pine and juniper berry-scented walk to the rim. Our balcony view from Maswik Lodge. 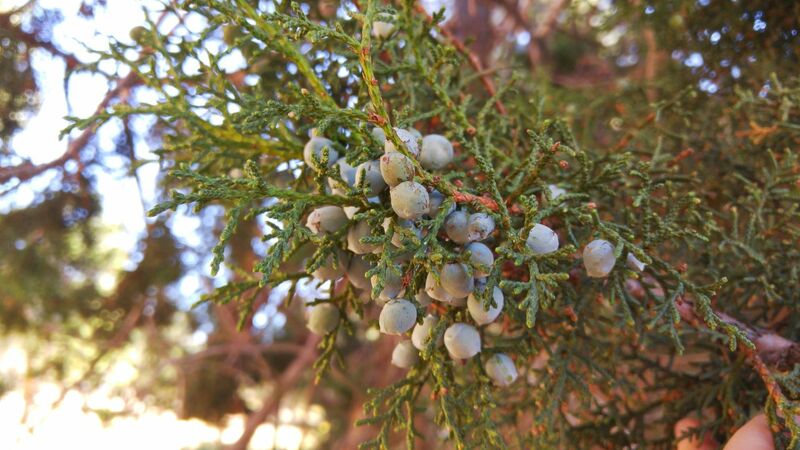 Juniper berries among the Ponderosa Pines. 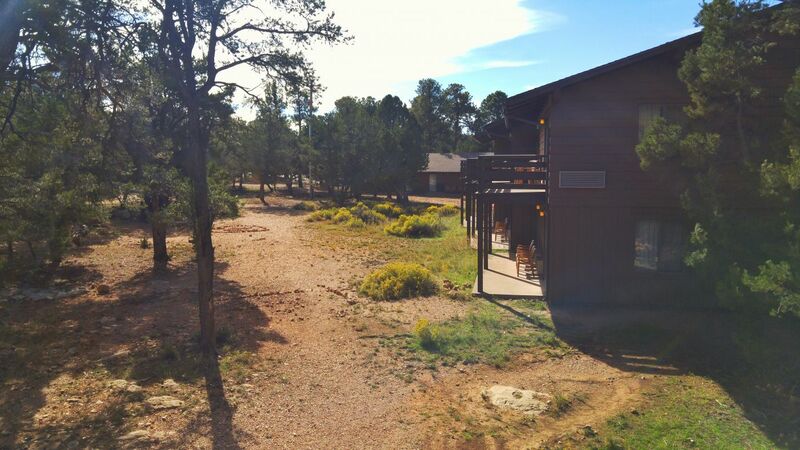 Maswik Lodge, Grand Canyon. It was very exciting to watch serious hikers gear up and begin their descent of the Bright Angel Trail. It was even more exhilarating to walk the rim at night and watch hikers’ bobbing headlamps from way below on the canyon floor as they made their way back up after hiking all day. I thought them very brave for continuing to head home in the dark. 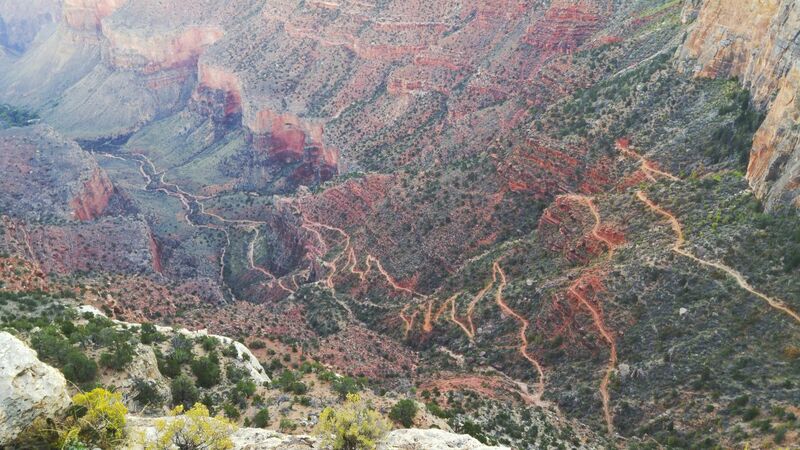 Bright Angel Trail is a strenuous, difficult trail at 12 miles roundtrip and an elevation of 6,850 feet. It is not to be attempted in one day, especially during the summer months. The last bit of trail is uphill with switchbacks all of the way, making the end of the hike very challenging. It is always impressive to find hikers nearing the top, whom we could see from just above the rim at the trailhead, with folks cheering them on, while others wait for loved ones to return. Over 250 people are rescued in the canyon every year. Nevertheless, someday we will hike to the basin and camp. Bright Angel Trail from above. Lovely switchback pattern. Gone are the days when weary travelers came by wagon or train bringing everything with them — food, water, supplies. Canyon Village is full of restaurants and ice cream parlors and supply shops, a library, church, artist studios and curios. Market Village is home to a grocery store, post office and more for those who stay longer, especially those who live there year round, like rangers, servers, cooks and managers. Our room at Maswik Lodge contained a mini refrigerator and coffee maker, and nearby was an ice machine. When we travel, we almost always bring our own food, so this was a helpful way to stay at the canyon and be self-sufficient. 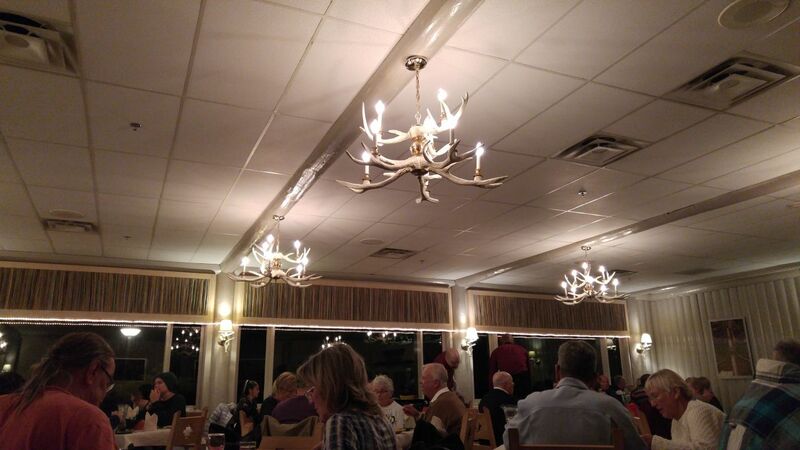 We did eat at the Maswik Lodge food court, as well as the Arizona Room once for dinner. 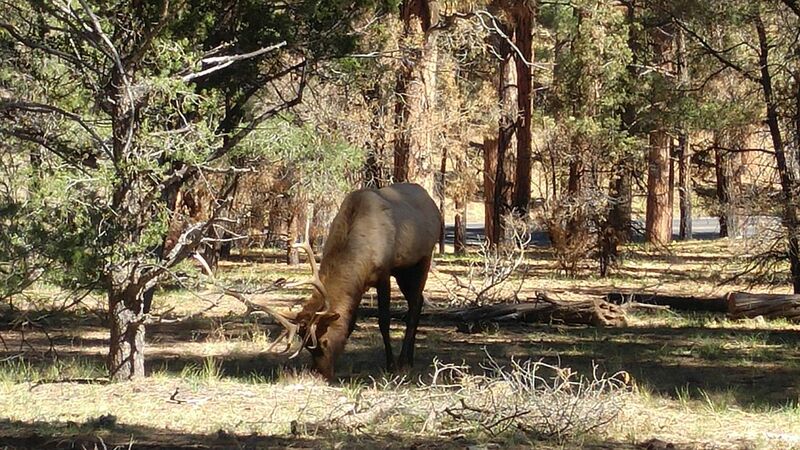 Eating, living and playing are all very easy in modern Grand Canyon National Park. Arizona Room dining room. Canyon Village, Grand Canyon National Park. From Canyon Village, free shuttle buses are available to take visitors to the West Rim, stopping along the various lookout points along the way for drop-offs and continued journeying to Hermits Rest, while stopping at only a few of the overlooks on the way back for pick-ups and return to Canyon Village. No cars are allowed on this roadway; however, cyclists and hikers can enjoy a peaceful, scenic 16-mile roundtrip to famous Hermits Rest. A picture of a picture postcard of Hermits Rest by Mary Colter. A whole family occupied the chairs while I attempted real-time photos. Photo credit: David Elms Jr. 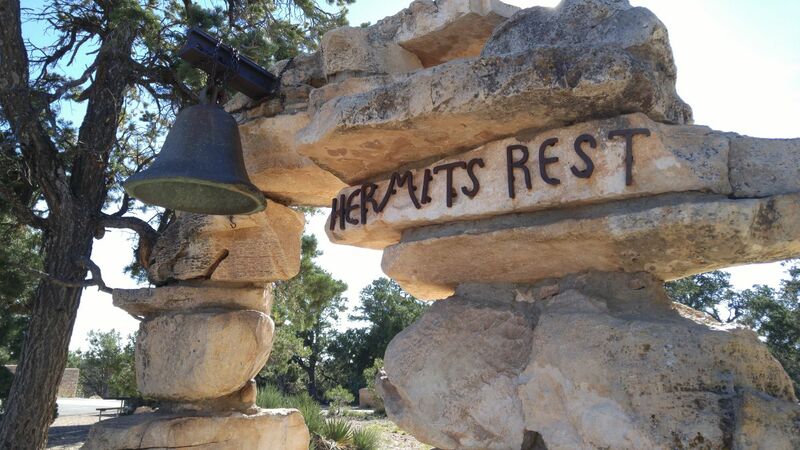 Built in 1914 and designed by architect Mary Colter, Hermits Rest is the westernmost point of Grand Canyon National Park. 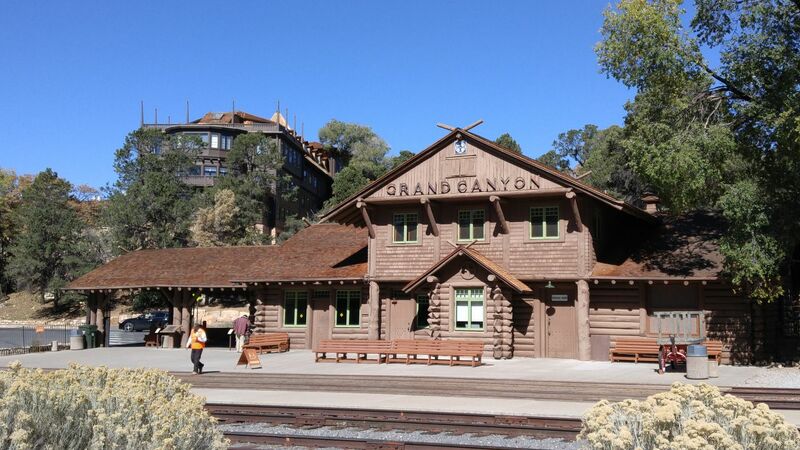 It was built to accommodate travelers in need of rest, who came by coach over a long and bumpy road en route to Hermits Camp via the Fred Harvey Company. 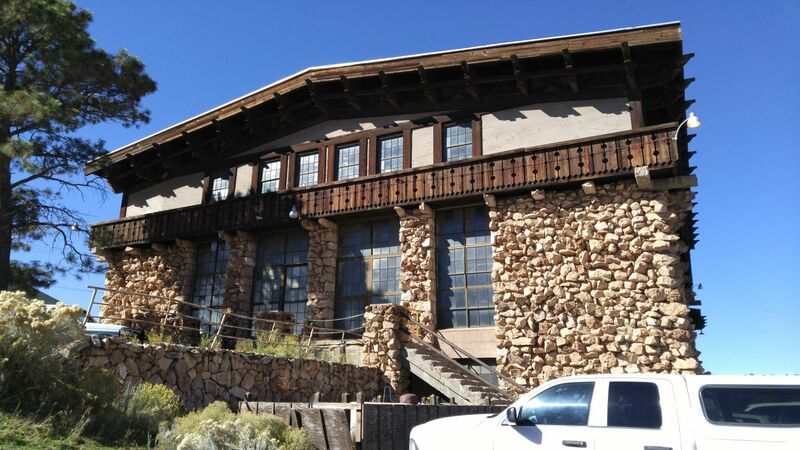 One of four structures in Grand Canyon National Park designed by Colter, Hermits Rest appears natural in its surroundings. Unfortunately, it is crowded now with people, souvenirs and a snack shop. It is difficult to take in the structure with so many distractions. However, it still is a place of rest, with picnic tables, vault toilets and spring-fed water taps. 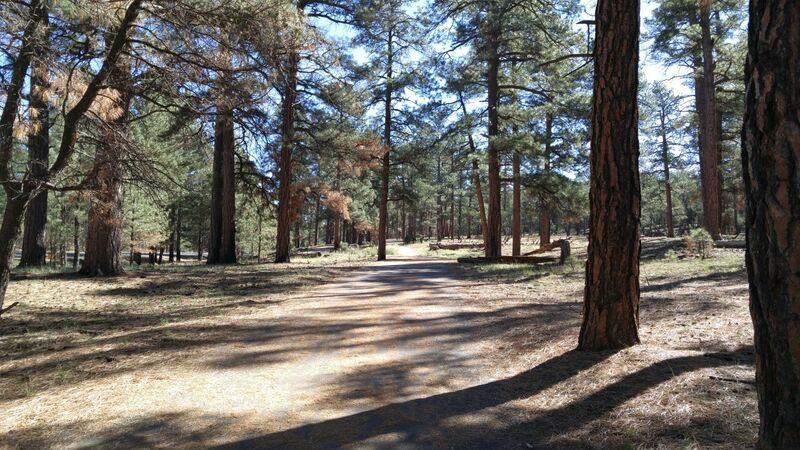 Furthermore, it maintains beautiful views (of course) and is the trailhead to Hermit Trail, an almost nine-mile hike at 6,640 feet elevation. Hermit Road and most of the lookout locations along it were constructed between 1934 and 1935 and are very well maintained. Equipped with snacks and supplies, Scot, Luna and I took the shuttle all the way to Hermits Rest, where we fueled up and geared up for a mile hike to Pima Point, our first stop. From there we could pick up a shuttle to take us to our next spot, Powell Point, where we would continue the hike the rest of the way — about two miles — to Canyon Village for sunset views. Don’t worry: Luna had the pleasure of many piggyback rides! Somewhere near Pima Point, taking it all in, including the Colorado River. A few miles down the road, Scot at the tip of Powell Point. Maricopa Point. The outcropping on the left is used for ranger training in rock climbing and repelling. The view south, including Bright Angel Trail, Canyon Village atop the rim, and the San Francisco Mountain chain near Flagstaff. Grand Canyon National Park. Moonrise over Canyon Village and El Tovar. 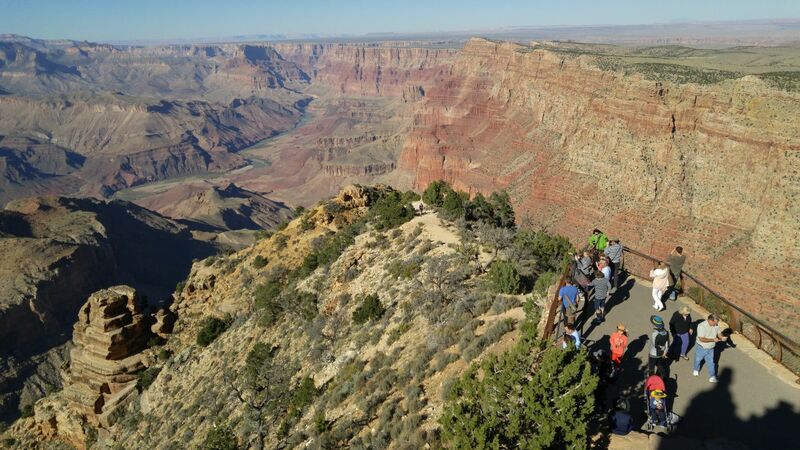 Easily accessible — including for people with disabilities — and free, a trip to and along the West Rim of Grand Canyon National Park is a must. The day after our tour of the West Rim, we headed by car along the 25 miles of the South Rim to the East Rim and Indian Watchtower at Desert View. 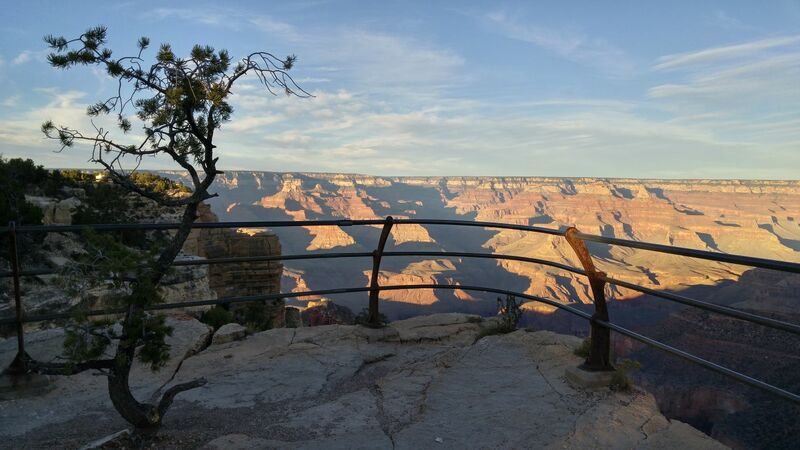 Because private vehicles and other forms of transportation are allowed to travel this road, the East Rim and Watchtower are highly trafficked, but it is worth the effort. Desert View offers stunning panoramas of the gorgeous landscape surrounding the East Rim, including Kaibab National Forest to the north and south; the Kaibab Plateau to the north; the Painted Desert and Navajo Nation Reservation to the east; mesas and mountain chains to the east; as well as the Colorado River. Facilities are more modern at this location and there is ample parking for all of the giant buses full of tourists from just about everywhere. Indian Watchtower, East Rim, Grand Canyon. A view of the Painted Desert and Navajo Nation Reservation from Desert View Watchtower. 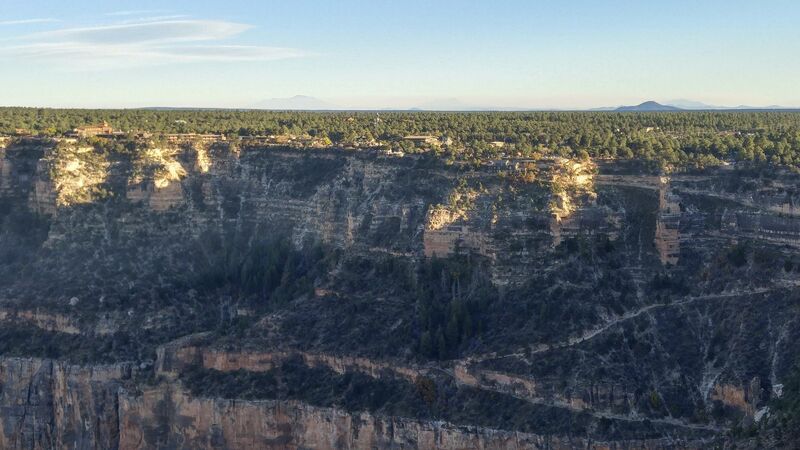 A view of the Colorado River, Kaibab Plateau and Layered Paleozoic Rock from Desert View Watchtower, East Rim. Looking west, views from Desert View Watchtower, East Rim. 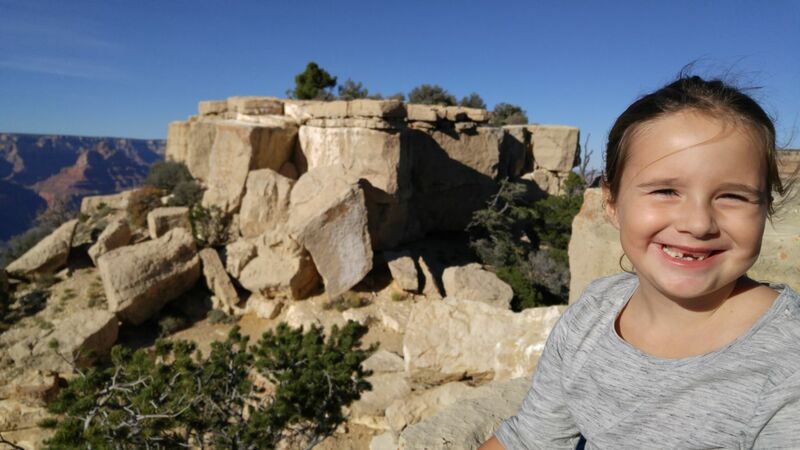 Indian Watchtower, also known as Desert View Watchtower, is another structure created by Mary Colter. It is reminiscent of ancient ancestral Puebloan watchtowers, although at 70 feet tall it is much higher than any Puebloan ancient dwelling. It is considered a rest and interpretive area. The watchtower is reinforced with a concrete foundation and hidden steel framework, but it also contains reclaimed wooden beams from other locations in the park. 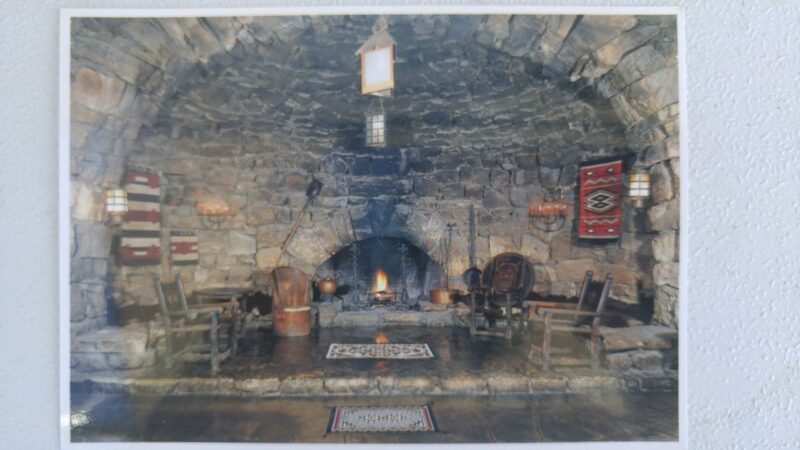 Furthermore, the original fireplace and furnishings remain, as well as the amazing and powerful murals by Hopi artist, silversmith and educator, Fred Kabotie, and Fred Greer. I would love to be able to sit quietly in this place. It is truly tranquil and magnificent at its heart. 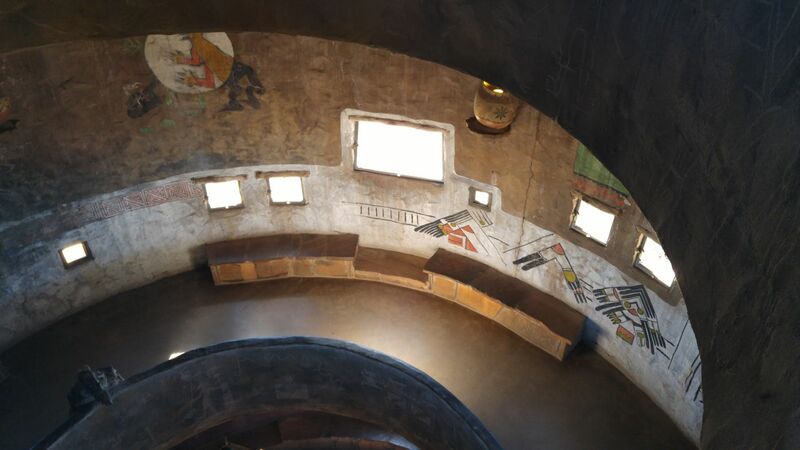 A view from above — Hopi murals at Indian Watchtower, Desert View, East Rim. The Kiva Room at Desert View Watchtower, East Rim. 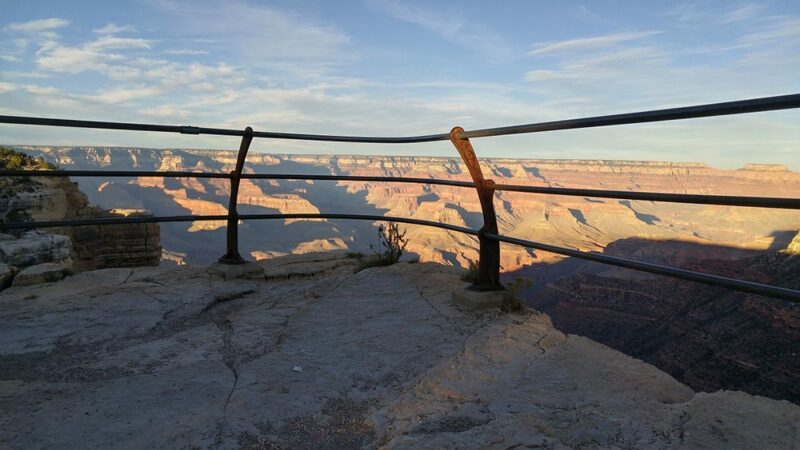 Stopping points along the way include Navajo Point, Lipan Point, Moran Point, Buggeln, Grandview Point and Yaki Point, as well as a few other unmarked spaces and places to park, look and meander. We took advantage of a few of them, stopping at the most enticing for a tailgate snack and cocktail hour, sunset and another moonrise. We also were lucky enough to see a herd of twelve elk grazing at dusk. 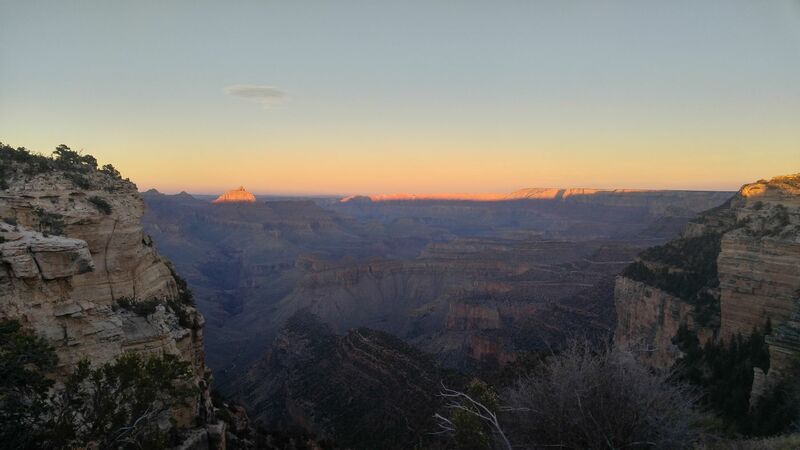 It was a spectacular day at the East Rim. Luna at Lipan Point, East Rim, Grand Canyon. More from Lipan Point, East Rim, Grand Canyon. A favorite spot for the day. East Rim. Duck-on-a-Rock Lookout at sundown for cocktails. (The tip in the background is not the “duck.”) The play of shadow and light in the canyon is always at work. East Rim, Grand Canyon. 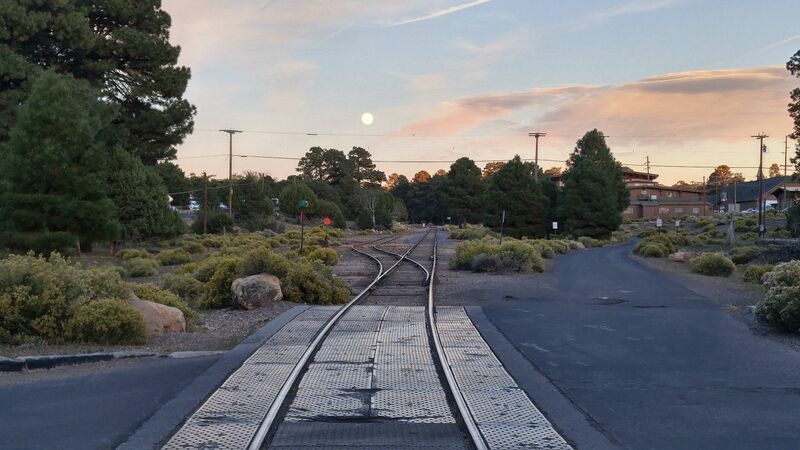 One more stop for the moonrise. 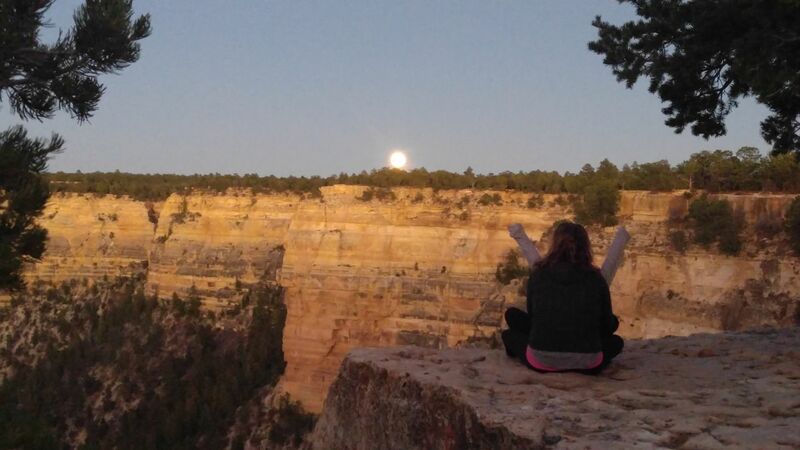 Moonrise, East Rim, Grand Canyon. 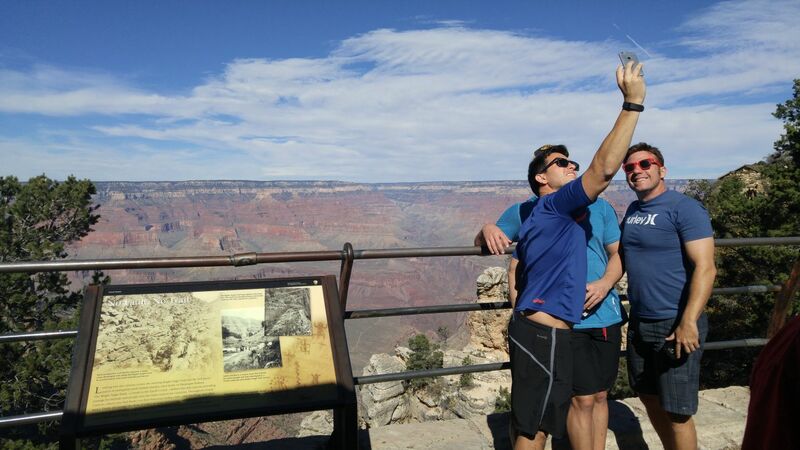 Obviously, there is an abundance of things to do at Grand Canyon National Park. It is wonderful to take one’s time and enjoy it. 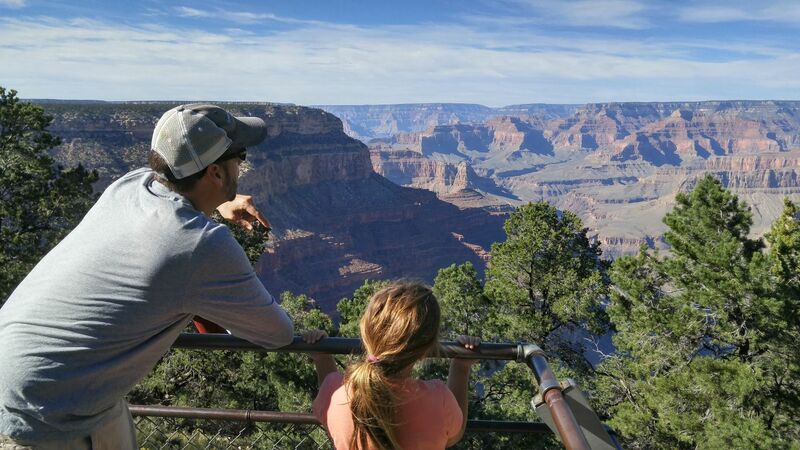 Besides visits to either end of the canyon, there is plenty to see at Canyon Village, in the woods or away from the rim. 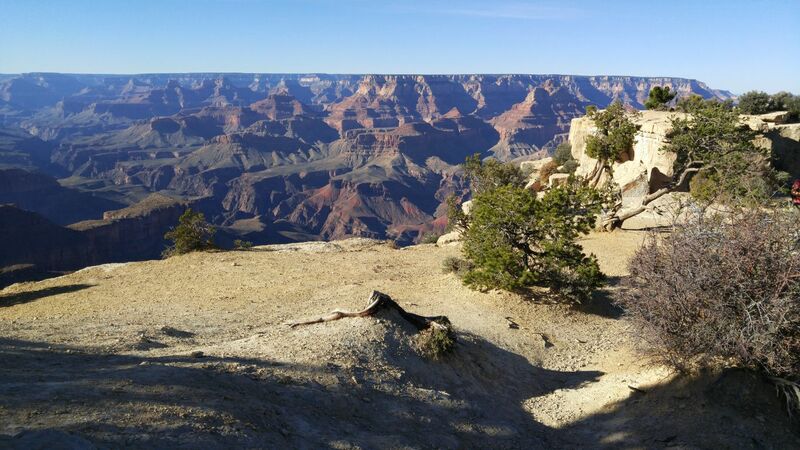 During walks, jogs and hikes, we were able to take in much of the goings-on at Grand Canyon National Park, reaffirming our love of this place and our want to return. 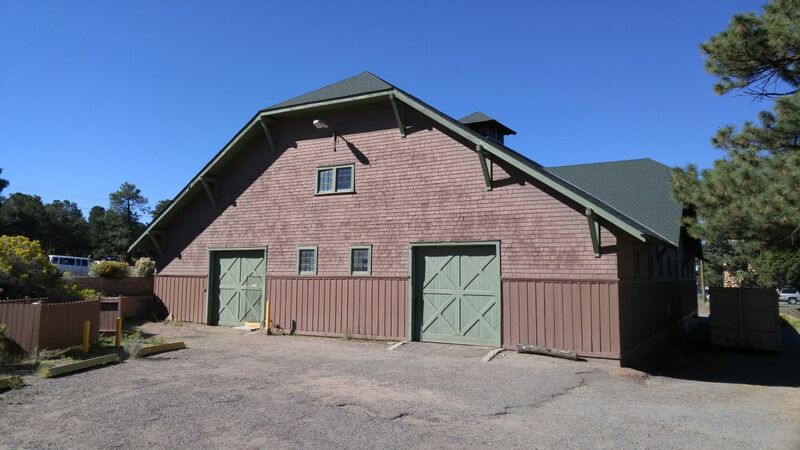 One of many barns at the canyon. 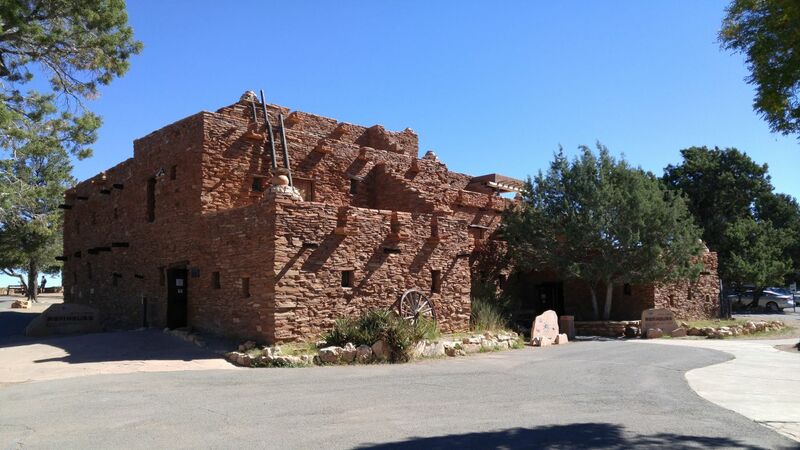 Original stone structure at Canyon Village. Train Depot and El Tovar in the background. Canyon Village. 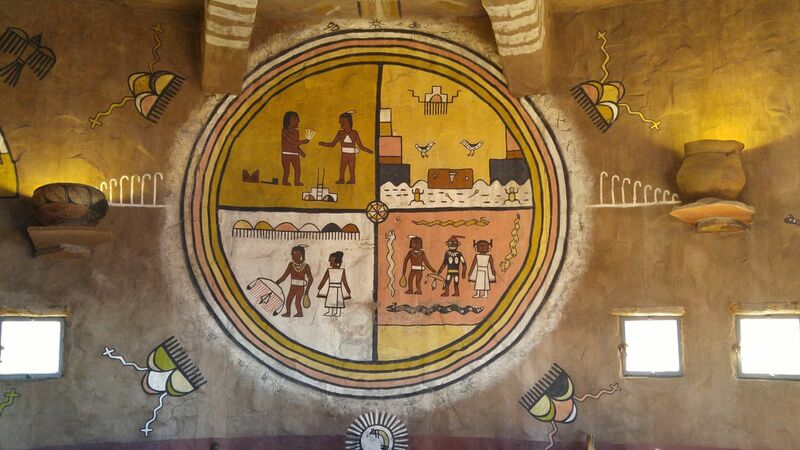 Hopi House, Grand Canyon Village. 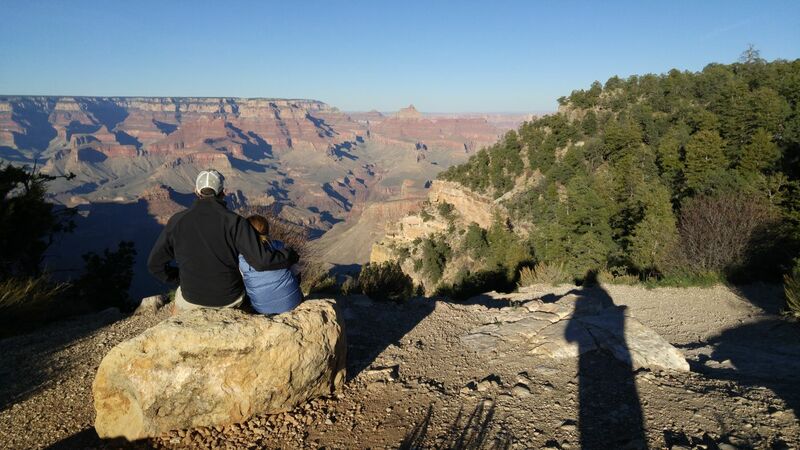 So how do we explain our visit to Grand Canyon National Park? It was enchanting, illuminating, outstanding and fulfilling. Another one of Luna’s “best days of her life” kind of experience. 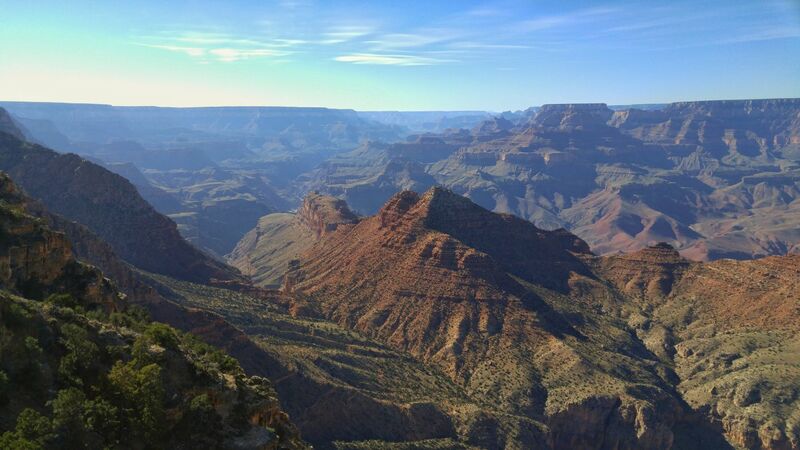 We are lured entirely by the canyon and the landscape around it — the largest swath of Ponderosa Pines anywhere that make up the Kaibab, Coconino and Tonto National Forests; the plateaus between Flagstaff and the canyon and around the rim; the relationship between humans and nature; the immensity of the canyon itself. Roosevelt was correct in his assessment of the loneliness of the Grand Canyon, for it speaks to solitude, to how small we are in the grand scheme of things and that experiencing aloneness can be a vital, beautiful thing. We have decided as a family that we shall return often to this magnificent, humbling place in northern Arizona as often as possible. It is truly grand. Great post, mirrors our days there last year very closely. Thanks for sharing and for jogging some great memories. Hope all is well! Beautiful pictures! So happy that Luna had a chance to see the canyon at such a young and impressionable age. Anxious to hear her stories.